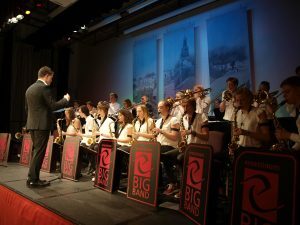 Over the Spring Bank Holiday week-end The Ernestinum Grammar School Big Band from our German Twin town, Rinteln, visited Kendal entertaining various audiences in the town and further afield. Joint performances with the Kendal Concert Band in the Town Hall, the Lakes Gospel Choir in Bowness, and the Burneside Brass band at the Factory Tap’s Spring Beer Festival, were all hugely successful as was their final farewell concert at the WOSP day centre. 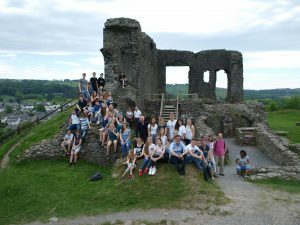 Each of the concerts were different in their settings and comparative musical genres but the young people from Germany took home with them experiences which will remain with them for a long time. New friendships are emerging with a visit to Rinteln being planned by the Lakes Gospel Choir in October 2018 following a second visit to Kendal by the Rinteln Gospel Choir at the beginning of the same month. These are in addition to visits this year by members of the Kendal Rinteln Association to Rinteln’s Alstadfest in August and by Rinteln’s Male Voice Choir to Kendal in September. Potential other future visits were discussed including the exciting idea of a dance weekend in Rinteln bringing together not only young people from Kendal and Rinteln but also from Rinteln’s other twin town, Slwano, in Poland. 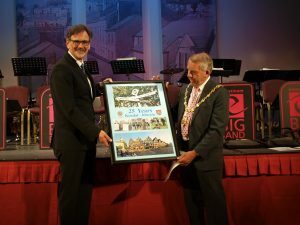 The Kendal-Rinteln Association, with support from the Town Council, facilitated and co-ordinated much of the visit and Dietrich Lange of the Rinteln Twinning Association in expressing his appreciation says…. As we approach the 25th Anniversary of the signing of the Kendal-Rinteln twinning agreement between our two towns it is encouraging to sense the commitment there is to ensuring the relationship endures well into the next 25 years.